Race winner Graham McRae (McLaren M10B) passing Cary Taylor (Brabham BT21). It was Graham McRae all the way in the 75-mile opening round of the Tasman Championship at Levin on 2 January. In his McLaren M10B Chev he set a 96.136 mph lap record on his second lap and went on to complete 63 laps at an average of 87.942 mph for a race time of 50 min 31.2 sec, which was 22.4 sec slower than the record set in 1969 by Chris Amon (2.4 Ferrari V6). Second was Niel Allen (McLaren M10B Chev) who held that spot for the first 13 laps then lost it to similarly mounted John Cannon and regained it in lap 38 to get within 13.9 sec of McRae at the finish. 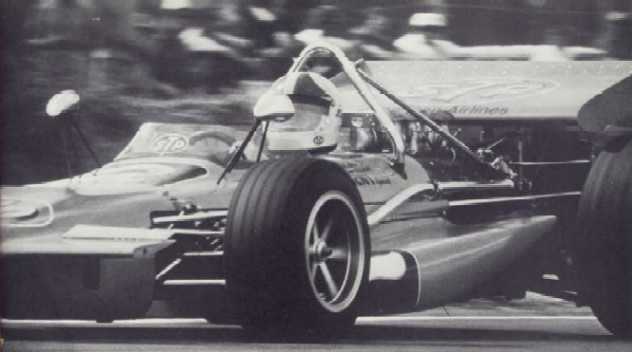 Amon, who drove hard in the torque-lacking March 701 2.5 Cosworth-Ford V8, was third, 6.9 sec behind Allen and 8.4 sec ahead of David Oxton (Lotus 70 Ford Boss 302). 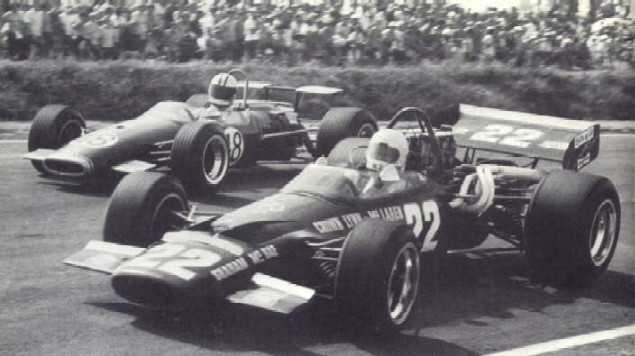 Four seconds later, Cannon came in fifth and Teddy Pilette (McLaren M10B Chev) was a lap down in sixth place. Favoured Frank Matich (McLaren M10B Repco) and Kevin Bartlett (Mildren-Chev) were uncontentious, and Mike Eyerly (Surtees TS8 Chev) abandoned the contest early with oil trouble. Rich Galloway and Bob Brown spectated because of pre-race crashes in their Lola T190 Chevs. McRae's 44 sec lap record was 1.3 sec better than the old mark set by Jochen Rindt (Lotus 49 2.5 Cosworth-Ford V8) in 1969. 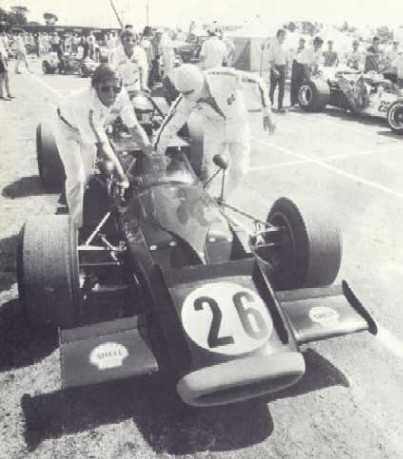 Niel Allen (McLaren M10B) preparing for the start. McRae dominated the Friday qualifying session and returned a 44.1 sec (95.918 mph) lap early in the day. No one could approach it, although Allen's 44.4 looked good and Matich was in the hunt with 44.7. By constantly swapping gears to keep the March in its effective rev band, Amon eventually made 44.9, a figure he might have improved upon if fuel pressure had not been down about 40 lb. A poorly designed pick-up tank had Bartlett contending with a fuel problem too and the Mildren-Chev was finally given a 46 sec best. Pleasantly surprised, Bartlett said he would not argue about that. Cannon and Oxton ran 46.3 apiece, and Ken Smith (1.8 Lotus 69 Cosworth-Ford FVC) and Evan Noyes (1.85 Brabham BT29 Cosworth-Ford FVC) were next with 46.7 sec. Pilette did 47.3 and Frank Radisich (McLaren M10A Chev), 47.4, while No 2 Rothmans Team Matich conductor Don O'Sullivan (McLaren M10A Repco) was given 48 sec. Behind the small-fry, Dexter Dunlop (1.6 McRae S2 FVA), Cary Taylor (1.6 Brabham BT21 Ford), Baron Robertson (1.8 Brabham BT23C FVA) and Dave McConnell (1.6 Lotus 69 Ford), came Eyerly, who was posted as last qualifier, with 50.5 sec, although McConnell had been given 51.1. Graeme Lawrence (2.4 Ferrari V6) did not appear because water had been found in the oil of both Dino engines, but he arrived in time to take last place on the grid for the rolling start on race day. The grid was as follows :- McRae and Allen, Matich and Amon, Bartlett and Cannon, Oxton and Noyes, Smith and Pilette, O'Sullivan and Radisich, Dunlop and Taylor, Robertson and Eyerly, McConnell and Lawrence. In perfect weather a record crowd saw all but one of the 18 contenders roll out for the warm-up lap. The absentee was Matich whose crew discovered oil leaking from one of the Repco V8's rocker-cover gaskets. He was not in place for the pace lap, in which Eyerly executed a spin that dropped him well back before the flag fell. Flooring his right foot, McRae headed off Allen, Amon, Cannon, Bartlett and Oxton and, when they reached the hairpin, back-marker Lawrence had already taken three cars to start a meteoric drive up to the front runners. McRae had 1.9 sec on Allen at the end of the first round and then came Amon, Bartlett, Oxton, Cannon, Pilette, Radisich, Smith and Noyes. Bartlett's chance depreciated in the midst of lap 2 when he spun at the hairpin, damaged the Mildren's front suspension and resumed, about nine places farther back, only to pit immediately for an oil pressure check. Matich set out just ahead of McRae, who was about to start his third lap, and the New Zealander was content to sit in behind the Australian, although this did not prevent him from increasing his lead over Allen to 2.5 sec at the end of four laps. In-fighting with Allen were Amon and Oxton and there was not much space between these three and Cannon, Pilette and Radisich. With McRae going away, Oxton took Amon to be third in lap 9. Cannon reeled in Amon in lap 12, Oxton in lap 13 and Allen in lap 14. A lap later McRae had 10 sec on Cannon, who was followed by Allen, Oxton, Amon, Lawrence (who was flying in the Ferrari), Pilette and Radisich. Matich had made up some leeway but lost most of it again with a couple of pit stops, and O'Sullivan also lost ground with a stop. McRae was content to maintain his advantage and exercise care as Eyerly's Surtees TS8 had liberally sprinkled the track with oil before coming to rest two laps too late. After 20 laps McRae was still 10 sec ahead of Cannon, with Allen in close and followed by Oxton. There was a gap to Amon, then came Lawrence, Radisich, Pilette, Noyes, Matich and Smith. Ten laps later McRae had stretched his lead to 12.8 sec, with the order the same; Lawrence prepared to take Amon, which he did three laps later. Cannon's luck changed as a tyre began to deflate and Allen regained second spot in lap 38. Lawrence spent only a lap behind Cannon before taking over third place. The order after 40 rounds was McRae, Allen, Lawrence, Cannon, Amon, Oxton, Radisich and Pilette. Next time round Oxton was ahead of Amon but these positions were permanently reversed a lap later. Nothing but misadventure could head off McRae, but second place was still open as Lawrence closed on Allen. Lawrence's tremendous bid came to an end in the middle of lap 54 when Radisich got sideways in the hairpin and Lawrence, about to double the M10A, made contact. He clipped the McLaren and severed an oil line. This cost Lawrence a sure third and possible second, while Radisich dropped a lap to be behind Pilette. With McRae and Allen secure, Amon took Cannon to be third with six laps left and a lap later Oxton also nosed ahead of Cannon.